While much of the season was strong, leaning into Lynch’s filmmaking style more than the original, there was perhaps no instance as striking as its final moments. The show’s ending is remarkable: It’s horrifying and haunting, but a complete stylistic departure from much of Lynch’s filmography. It is without a doubt the strangest ending to a TV show ever, but also, perhaps, the most fascinating. “The Return” has an incredibly elaborate and dense narrative; for this reason, I’ll try to be brief in summarizing the plot of the final two episodes. “Episode 17” follows many beats of a traditional, upbeat finale. Many of the main characters are reunited; the forces of evil are crushed by the forces of good; there’s even a romance. Fulfilling a plan to crush an evil supernatural force nicknamed Judy, FBI Agent Dale Cooper (Kyle MacLachlan) is sent back in time to the night of Laura Palmer’s murder. He finds her and guides her away from her fated demise. But as the two are walking through the dark forest, she screams, and suddenly is gone. Picking up where that scene left off, “Episode 18” sees Cooper return to the present. He’s seemingly fulfilling every step of the plan, and then, finally, meets up with a woman who by all appearances is Laura Palmer. Only, she claims to be a woman named Carrie Page (played by Laura Palmer actress, Sheryl Lee). Undaunted, he asks her to take a drive to Twin Peaks, where they head to Laura Palmer’s old house. A woman answers the door; she isn’t Laura’s mother, nor has she heard of the Palmers. The pair walk down the house’s steps, standing in a dark suburban street. Cooper, confused, asks, “What year is it?” Carrie doesn’t respond. Laura Palmer’s mother is heard off in the distance, calling out to her daughter. Carrie looks up at the house. She screams in horror. The lights in the house blackout. The screen cuts to black. Roll credits. The question of why this incredibly vague and abstract ending is so haunting has been difficult for me to answer, but I think I have found some semblance of an answer. Much of the final scene’s power (and horror) comes from how Lynch uses uncertainty. Laura Palmer’s death, the inciting incident of the entire show, is undone, but the consequences of this are never shown. It’s not clear what, if any, of the show’s plot actually happened. The entirety of “Twin Peaks,” may or may not have been entirely destroyed. It’s not just the plot that has been thrown into chaos: Agent Cooper, too, no longer seems to be acting like himself. In a scene at a diner, he saves a waitress from harassment by three cowboys. While this act of heroics is in line with Cooper’s character, he does it in a way that is nothing like the Cooper of the original series. The Cooper seen at the diner immediately leaps to violence as opposed to more peaceful methods. He behaves like a deranged vigilante as opposed to the methodical, albeit quirky, white knight of the original series. Gone is the off-beat heroism of the FBI agent whose goal was to track down Laura Palmer’s killer; replacing him is a man who may or may not still have his sanity in check. The result of this is that we, the audience, are left with a sense of total uncertainty. Everything that we thought we knew about “Twin Peaks” is no longer a given. 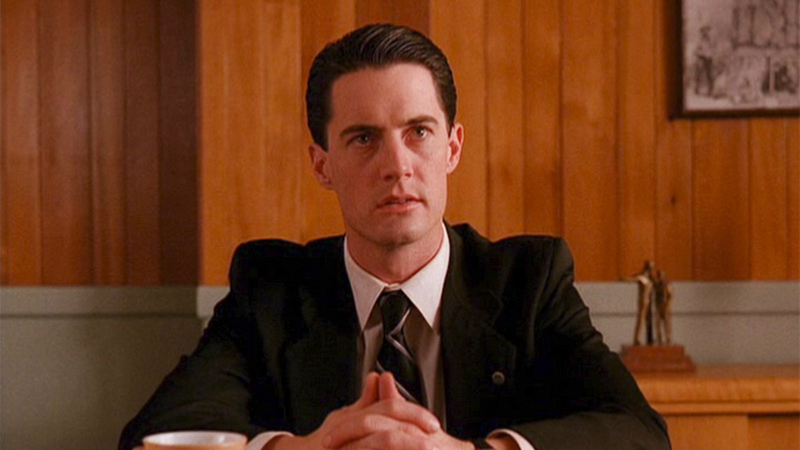 Cooper may have never tried a “damn fine cup of coffee” at the Double R Diner; his evil doppelgänger may have never left the Black Lodge. After hours invested into watching the show, the most basic of facts about it may no longer be true. Lynch uses this sense of uncertainty to craft the show’s final, horrifying moments. The sound of Carrie’s screams is terrifying, not only because they’d be terrifying in a normal situation, but because it’s impossible to know what prompted her. The simple image of house lights blacking out would normally be only a little unsettling; but because of the uncertainty Lynch crafted throughout the episode, it becomes a menacing image. We’re left both literally and figuratively in the dark. Furthermore, the ending is incredibly unexpected. This is somewhat a given, as “Episode 18” follows such a non-traditional story arc. But the ending is also unexpected because Lynch completely inverts his own stylistic tendencies. Most of Lynch’s filmography features elaborate, surrealist horror. The ending of “Eraserhead,” for example, sees a deformed baby growing into a massive, terrifying monster, who seemingly attacks its father. The iconic finale of the original “Twin Peaks” featured a demonic spirit possessing, murdering, and creating identical doppelgängers of multiple characters. But the final scene of “The Return” is far less complicated. Besides the sound editing, the final scene is straightforward and simple. This simplicity adds to the brilliance of the final scene. Carrie’s unexpected scream is shocking in and of itself. But it’s ultimately more of a surprise that Lynch completely subverts the stylistic tendencies he’s known for. Yet, I can hardly call the final moments of “Episode 18” a perfect ending. It’s remarkably frustrating and anticlimactic. Many of the various stories I’ve invested hours into are never given a proper conclusion; it’s pretty likely that all those stories were wiped out by Cooper’s time travel. The pacing of “Episode 18” adds to this frustration. Much of the episode is incredibly slow-moving, featuring lengthy scenes of people driving, with almost no dialogue between them. For all that to lead up to what is, essentially, an anti-climax, is undeniably upsetting. Still, it’s been a year since the ending aired, and I still can’t get over it. I haven’t even discussed what it might “mean,” or the various theories about what’s “really going on.” I haven’t discussed the various critical reactions to it, with some claiming the ending was oddly hopeful. I’ve barely even touched on the show’s mythology at play in those final moments. Maybe something frustrating, confounding, and anticlimactic can still be remarkably brilliant. Lynch has often claimed that the more mysterious something is, the more beautiful it is. While I would definitely describe the ending of “Episode 18,” as mysterious, I don’t know that I could call such a horrifying scene “beautiful.” It is, however, a brief moment that’s held my attention for over a year and will probably continue to hold my attention for many years more. That might not qualify as “beauty,” but it’s definitely something remarkable. Like you, I find the ending keeps coming back to my head, as do other moments of the series. I think I have a higher estimate of the ending than you do; I consider it brilliant. Not quite — just before Carrie screams, we hear Sarah Palmer, Laura’s mother, call out “Laura?”, evidently from inside the house (although I suppose you could argue it’s inside Carrie’s head). It’s the same call (if now more distorted) that we heard her make the day when she couldn’t find Laura in her bedroom. Later that same day, she would find out that her daughter had been murdered. Knowing that Carrie screams after that call does provide us with some implications about why she’s screaming, although no definitive answers. You also have to couple that clue with Cooper’s fearful, perplexed “What year is it?,” which comes right after he walks forward and backward like Mike in the red room, with arm outstretched like Dougie. In the end, we still have something that’s very open to interpretation, but there are pointers in a general direction.